Sasha King dreams of being a serious novelist and living the good life with her surfer boyfriend, Brock. But her day job as assistant producer of Project Icon, a once-mighty ratings juggernaut that's recently taken a hit in viewership, keeps her working nonstop. She's got her hands full with Icon's two new celebrity judges, entrepreneur-actress-singer Bibi Vasquez ("Crew to be forbidden to make eye contact with Artist AT ALL TIMES," reads her contract) and Joey Lovecraft, a horny but spiritual rock legend who doesn't even own a TV (it goes against the teachings of his guru, Tibetan high lama Yutog Gonpo). As the competition among the young would-be stars - including foul-mouthed, opera-trained Mia Pelosi and apple-cheeked yodeler Jimmy Nugget ("It's like Roy Rogers made love to a Bee Gee!") - heats up, Sasha finds herself constantly putting out fires. A date with a mysterious stranger makes her rethink her devotion to Brock. And then an unexpected revelation rocks her world. 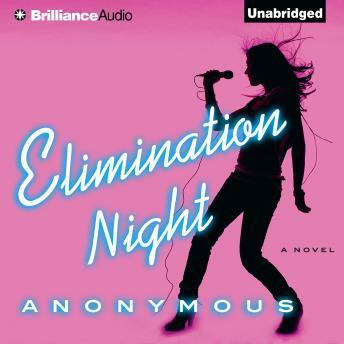 Add a frighteningly smooth host (Wayne Shoreline), muckraking gossip columnists, and powerful people named Nigel, and you have the pure madcap listening pleasure of Elimination Night, a book so searingly accurate about the talent show machine that it had to be written anonymously.